Qualified from the University of Sheffield in 2009 and has been practicing in Essex since then. Teki is in the process of completing the MJDF Post graduate qualification from the Royal College of Surgeons and the MsC programme in Restorative Dentistry at the Eastman Dental Institute(UCL). Teki has a passion for improving smiles without compromising the health of teeth by using the latest minimally invasive cosmetic Dentistry techniques. He is a certified provider of the six month smiles adult cosmetic braces system. 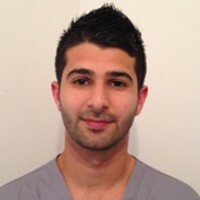 Teki is a member of the British Dental Association and attends post graduate courses on a regular basis. In his spare time he enjoys playing for his local football team and cycling. Having always been terrified of the Dentist, I joined Hockley Dentals Surgery 10 years ago on recommendation from a friend also nervous of Dentists. Since then I have had treatment without having to be sedated (a first since I was 10!) & recently had root canal treatment from Teki. Something which I was terrified about but all the staff from reception to the dental assistant & Teki were all so patient & understanding of my fear. Teki talked me through the treatment step by step & made me feel like I was in control & that it was not the ordeal I had built it up to be. So much so that when I returned to complete the treatment I even had a smile on my face! I can't recommend Hockley Dental Surgery & there staff enough. Teki is always very welcoming. He always has a smile an a very nice manner. I was terrified of dentists and took me many years to pluck up the courage to go. I booked my appointment and was told Teki was my dentist. He was absolutely fab, he explained all the treatment I needed and was very gentle. Now I have found a dentist I trust I will be going regularly for checkups and not leaving it years again. I can not recommend this dentist highly enough! Even with my dental phobia I have always been treated with courtesy and understanding and they have listened to my concerns. All treatment has been carried out efficiently and all options explained clearly. Teki is amazing. Kind, considerate and done a wonderful job straightening out my smile. Would recommend. MEET DR TEKI FOR THE FIRST TIME IN JULY. HE SEEMED VERY NICE AND HELPFUL. Very happy with the service at present. Myself and my children saw Teki for our check ups, and I was delighted. He is kind, thorough and was more than happy to answer all my questions. I really felt at ease, and my children think he is great. Would recommend. I saw Dr. Teki for the first time last week and he is lovely, explains all the treatment in detail and is patient and gentle. I was always delighted with the treatment from Dr O'Regan but am now just as happy with Dr. Teki. No worries.